In just 20 minutes, you can mix the ingredients for this luscious, creamy, magnificent-looking Pumpkin-Cream Cheese Flan. Cook and stir 1 cup sugar in small saucepan on medium heat 5 min. or until completely dissolved and deep golden brown in colour. Immediately pour into 9-inch round pan; tilt pan to evenly cover bottom with syrup. Blend milk and cream cheese in blender until smooth. Add 1 cup of the remaining sugar, eggs and pumpkin; blend well. Pour over syrup in pan; cover with foil. Place pan in larger pan. Add enough water to larger pan to come halfway up side of filled pan. Bake 50 to 55 min. or until knife inserted in centre comes out clean. Remove flan from water-filled pan; place on wire rack. Cool completely. Refrigerate 4 hours. Meanwhile, bring remaining sugar and 2 Tbsp. water to boil in small saucepan; cook 5 min. or until golden brown, stirring occasionally. Remove from heat. Add nuts; stir until evenly coated. Spread onto foil-covered baking sheet. Cool completely. Run knife around edge of pan to loosen flan just before serving; unmold onto plate. Break nuts into smaller pieces; sprinkle over flan. Bake and refrigerate flan as directed. Run metal spatula or knife around edge of pan. Invert flan onto plate; shake gently to loosen. Gently twist pan to remove flan from pan. To soften any remaining caramel, dip bottom of pan in hot water; spoon caramel over flan. Add 1/4 to 1/2 tsp. grated gingerroot to the cream cheese mixture before pouring into prepared pan. Store any leftover flan in refrigerator, and store any leftover candied nuts in airtight container at room temperature. Sprinkle nuts over flan just before serving. Looking for a dessert to serve at a holiday party? 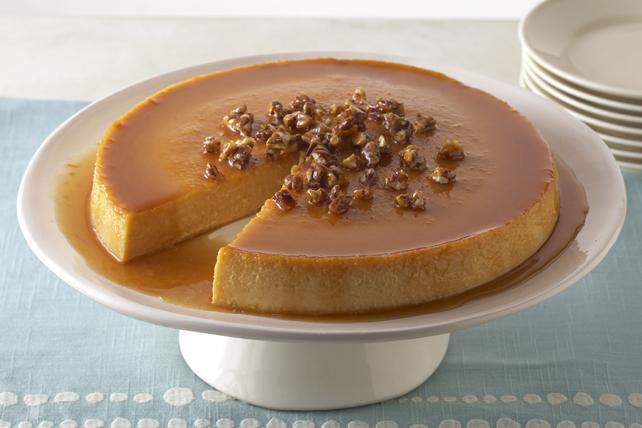 Since this delicious flan serves 10, it's the perfect ending to your holiday meal.